I love the Olympics. I love almost everything about them. As I get older, I don’t just watch the sports I play (tennis), or wish I played (competitive soccer). I appreciate ALL the athletes’ tremendous talent and dedication, and am now more likely to take the smorgasbord, all-you-can-eat approach to the games. I watch everything. So, I may not know the difference between a sabre and an épée… but I have decided that fencing is cool. I especially like it when competitors trick out their face shields with their national flags. And when their helmets are electric, and light up when touched by opponents’ weapons – that’s even better. 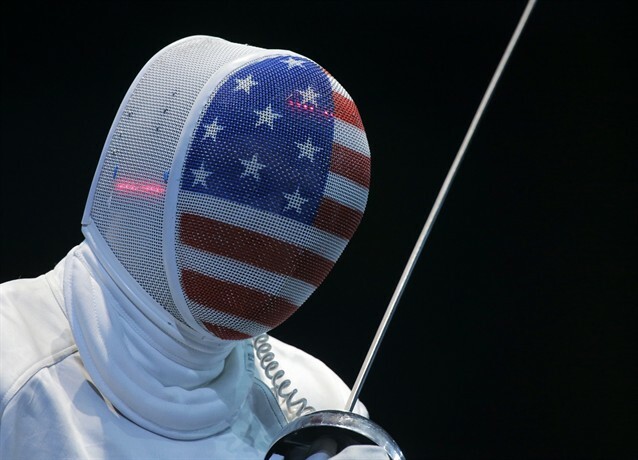 But what of those fencers who don’t have flag masks, and just wear… WHITE? I mean, clearly that is some kind of subversive statement, no? It IS! Just ask our friends at Fox News. It truly is a slow news day when, in a quest to say something – ANYTHING – to rile up viewers, pundits at Fox News criticize America’s gymnasts because of what they are wearing. That’s right, Fox’s America Live host Alisyn Camerota has taken the U.S. Women’s gymnastics squad – comprised of girls averaging 16 years of age – to task because, in the process of winning gold medals last week, they wore leotards that were (*gasp*) hot pink. See this is where I get confused. I had assumed that the choice of leotard color was — for these teenage girls who have devoted their lives to the DREAM of representing the USA in the Olympics — a matter of looking pretty. Of making their families, friends and America proud. Of matching their attire with their copious amounts of hair glitter. Turns out, leotards are supposed to conjure up bloody battlefields? Sorry, I just don’t follow. Don’t get me wrong, I love our flag. I wave it with the best of them. I get choked up every, single time an Olympic champion takes the top spot on the podium for the playing of the Star Spangled Banner. But to those who laud our “stars and stripes” as a unique representation of the United States… I did about 90 seconds of internet research today, and discovered something shocking. SHOCKING! Red, white and blue. The stars and stripes. We don’t own them! So get over yourselves, you sanctimonious rabble-rousers at Fox News who just CAN’T LET AMERICANS FEEL GOOD for once. We get it, you made your fortune and built your viewership by scaring the bejesus out of people. Look out, it’s a Muslim! It’s Planned Parenthood! It’s a high school science teacher with a fossil, talking about Darwinism! Picking on dedicated, talented teenaged girls who are bringing home a gold medal? That’s beneath even you. Gabby, McKayla, Aly, Kyla and Jordyn. You know it’s coming ladies. Fox News will come a knocking, wanting an interview. Don’t say no. Do it… but be sure to wear hot pink!